Turn screen time into learning time for your kids. 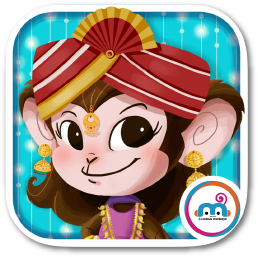 Play our multilingual App and discover India! Cool and creative app: Heritage is fun! My daughter 7yrs old likes playing and saying the words out loud. We hook it up to the TV using AirPlay and then she does the indian dance moves while playing dress up. What a nice fun app for young kids! My 3 year old daughter loves it, and love to see her play and learn new things. A fun way to integrate learning about indian culture and play!! Looking forward to more fun stuff from the creators of 3 curious monkeys!